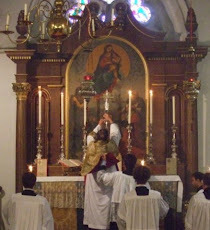 Fr Hunwicke's Mutual Enrichment: Doncha just love him? What a revealing explanation poor little Cupich has indeed given of why PF is right to refuse to answer questions about the Vigano Testimony: He's too busy sorting out Ecology and Migration ... and, Lo, right on schedule, last Saturday PF launched an attack on Plastics ... the Plastics of Satan have, one gathers, entered through some crack into the Church ... It all reminds me of a story I heard from an American round about the time of the Viertnam War. A woman is explaining how her husband is truly Boss: "He makes all the important decisions ... international politics ... who should be the next President ... nuclear war ... I just make the small unimportant decisions about things like how we spend the money, where we live, how we bring the children up ..."
Life really is hilarious, isn't it? I know many of you long each day to hear that this pontificate has ended, and of course I'm totally with you really, deep down; but we shall lose an awful lot of laughs when it does end. I have manufactured neat little notices which I pin up whenever I come across an example of some non-reader of Laudato si having fly-tipped rubbish in a beauty spot; or on beaches covered with curial condoms: POPE FRANCIS HAS BEEN INFORMED, or BIG FATHER IS WATCHING YOU. "What's that you say, Holy Father? You never saw that dossier? Nobody ever told you there was a safe in your study? And, in any case, someone else had mislaid the key? If you do ever come across the dossier, of course you will take action? You only learned about it from the newspapers? Through absolutely no fault of your own you are surrounded by people who constantly misinform you and brief you badly?" Eccles, the satirist, described the renewed plastics enthusiasm of Pope Francis as 'clutching at straws'. As one of your female readers, I confess with shame that my reactions to Mgr Cupich are slightly more violent, with a definite inclination to knee him in the you-know-where. "Episcopath" -that is my coinage for prelates like Cupich. Among other things, he is the great champion of "primacy of conscience" while not troubling much to explain how conscience is formed or critiquing the individualism that would render the Faith a meaningless adjunct to the vaunted authority of the sovereign conscience. An aapproach that additionally undermines Catholic challenges to, inter alia, torture and capital punishment. What a putz. The Church opened its windows and doors to the world and then the Pope was constrained to be shocked to discover that the Prince of the world had tagged along. The devil did not slip through any crack; he walked through the opened and unguarded front door when he who had authority chose to reject the truth that our ancient and permanent enemies are The Word, The Flesh, and The Devil. Our first ancient and permanent enemy is the world and it was our number one enemy that our Blessed, and soon to be Caninsed, Pope welcomed into the Church and embraced it and praised it. Leo XIII, Humanum Genus  :“ The human race is split into two hostile camps, both of which are engaged in a constant battle, the one for truth and virtue, and the other for all that which is opposed to these. The one is the true Church of Jesus Christ… and the other is the Kingdom of Satan. Because the world is a worse enemy than Satan, it helps to substitute Satan for United Nations to get an idea of what a malign message was being advanced and taught by our Blessed Pope. There is being established here a system of solidarity which receives the regular and unanimous support, for its supreme civilising objectives, of the whole family of peoples for the good of each and all. This is the finest aspect of the United Nations Organisation, this is what gives it its most genuinely human guise  ; this is the ideal that mankind has dreamed of in its journey through history. We would venture to call it the world’s greatest hope, for it is the reflection of God’s design – a design transcendent and full of love – for the progress of human society on earth, a reflection in which We can see the gospel message, something from heaven come down to earth. Yes, from Pope Leo XII to Pope Blessed Paul and beyond, it is all continuity. Continuity of Continuity and all is Continuity. It is truly to be hoped that at least one of three cardinals who prepared the dossier for Pope Benedict will have kept a copy and will see that it is proper to release it, in spite of any secrecy commitments, which should not apply anyway in this case. I suspect tears behind the smile, Father. Well, at least if all the homosexuals gather in the new world in the stars their stay will be limited - no procreation, ya know! We can only hope that Francis does discipline Archbishop Vigano as is rumoured, as that action is so blatant that the do-do (or ca-ca as Francis would have it) will hit the fan. Speaking of dossiers, am I the only one who remembers the dossier Archbishop Dwyer prepared on the American Church half a century or so ago? That one seems to have gone down the memory hole even faster than this one. "Antinoopolis" isn't on Father, as that fellow's imperial Uncle was a bit of a philosopher, unlike our dear Pancho, with a sense of the duties of his office. Vide Cassius Dio, Historiae Romanae 69.6.3. "... beaches full of curial condoms ..." What a line! How tragic that it is both scurrilously funny and pointedly apt. I fancy birds as well. Always have. But I try to keep it quiet from the missus. Oh, Father, our revered host, events are driving you to the limits. I am afraid that whatever happens next will exceed even your powers of parody and sarcasm. Well, I will take a deep breath, have another hearty laugh, say a rosary, and think about Sue's delightful image of giving Cupich a knee. Did you see that 2 priests from the Chicago archdiocese while visiting Florida were caught committing an act of "clericalism" in broad daylight, in a little Volkswagen without tinted windows? Near a playground - so I heard? Cardinal Cupich, then Bishop Cupich, was well know in Spokane, WA. of the early-mid 1990s of having Gay Friendly Cathedral. Moving to Mars is excellent advice for us all! Their year is, after all, 668 days long, which would give us lots of room to loosen our sanctoral belt and let out the calendar. We could extend the week a bit, too, and fix the Roman breviary! I have thought for quite some time that much of the hierarchy has suffered from a nostalgic longing for the Empire, and a misplaced hope that the UN might fill that lack. Q.v. St. John Paul's line in a speech in NYC: "Welcome to the capital of the world!" For those who didn't see it, he said that as if it were a nice thing. Anna, I saw that as well. Not my part of Florida. It wouldn't necessarily be safe for them here if the police weren't the ones who found them.